Does this moneybelt make me look fat? How to foil pickpockets and avoid scams while traveling. Crossing a crowded street in Madrid, I happened to glance at HOB and saw a teen girl unzipping his backpack. The second she saw me notice her, the girl melted into the crowd and disappeared. At a café in Istanbul, a toddler suddenly appeared, and just as I warned “look out!” he had his hands on our table trying to make off with whatever he could grab. Fortunately, HOB has quick reflexes and was able to stop him. As we left we saw his mom/collaborator in theft about 20 feet outside the café. I often talk to travelers who think they can outsmart pickpockets, that if they just put their wallet and passport in a front pocket they will be fine. “Believe me” they say “I would notice if someone put their hand in my pocket. I wouldn’t let them get away with it.” Well, believe me: these pickpockets are really, really good at what they do. Think about it, we saw an honest-to-God toddler stealing from tourists at a café–if that kid started when he was two, how skilled will he be when he’s 30? 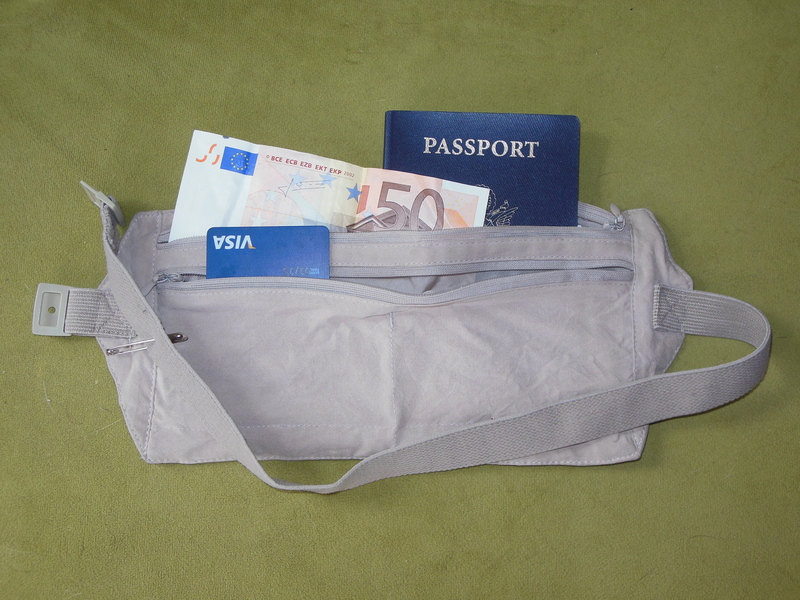 I’ve also had travelers argue that “You don’t wear a moneybelt at home, Europeans aren’t wearing moneybelts and they live here–why do I need to wear one?” Well, in the first place, I hardly ever carry more than $20 at home. Most importantly, though, your passport is essential when you travel. Lose it and you can’t fly, you can’t go home without a huge hassle and expense, and you’re much anticipated trip will be ruined. Why risk it? Your best defense is a moneybelt. Moneybelts range in style from the elastic-around-the-waist variety to hang-around-the-neck-under- shirt to hidden-pocket-attached-to-your-belt-loop. You may need to try more than one to find what works for you. The important thing is to use it, and never leave your hotel room without it securely hidden under your clothes. Think of the moneybelt as deep storage: keep your passport, credit cards, and the majority of your cash in there. You can carry a normal change purse or wallet in your front pocket, but just have enough cash in it to get you through you day’s activities. The idea is for no one to know you’re wearing a moneybelt at all. Be selective about choosing an ATM. I have a strong preference for ATMs inside a bank. I’ll withdraw money while HOB stands like a security guard as I retrieve the cash, stuff it into my moneybelt with my debit card, zip the moneybelt back up and cover it with my clothes. Airport ATMs, once you’ve passed through security, make ideal euro replenishers. Watch out for short-changing scams. We’ve had cashiers deliberately short-change us from places as varied as the Alhambra entrance to a bakery in Bari. HOB and I (neither a brain trust when it comes to math) always calculate our change together when handing over cash. Keep an eye on your stuff. I will keep reminding you on this blog to pack light, and here’s another great reason: less stuff = less to keep track of. Don’t hang your bag over the back of a chair while eating. If you hang your jacket behind you on your seat, make sure you have nothing important in your pockets. Hold your bags in front of you in a crowded street or train. Use extra caution at train stations and on public transportation. Theives know this is when you are most vulnerable: feeling lost, confused, jetlagged, and in a rush. Refuse offers of assistance with ticket machines and don’t let that friendly man carry your bag. Most especially, look sharp when entering and exiting subways and turnstyles. If you’re in a crowded area and there’s a ruckus (like an argument or someone takes a fall off a bike) be aware that this could be a scam: while you’re looking at the commotion an accomplist takes advantage of your distracted state to rob you. Don’t sign petitions, talk with someone who claims to have found a lost “gold ring”, let someone tie a string bracelet to your hand or accept a sprig of rosemary from a Roma woman. Hey straight guys: if you’re traveling alone in Eastern Europe and a gorgeous lady hits on you and asks you to buy her a drink, refuse. Chances are, stud muffin, the bar she takes you to will be run by her cousins, and that beer will cost you a hundred euro, which you’ll have to pay on threat of being beaten. Spain is loaded with pickpockets, especially Madrid and Barcelona. Be extra vigilant at touristy areas and on public transportation in Rome, Milan, Naples and Paris. Keep a low profile, don’t wear expensive jewelry or carry status bags. While I could care less about status accessories, I am an incurably flashy dresser (sequins? why not, it’s Thursday), so this last part is hard for me. I don’t wish to give the impression that Europe is unsafe. Honestly, HOB and I are more in danger of being the victim of a violent crime at home in Chicago than when traveling abroad. Most people in the world are decent and not out to rip you off. Even when I’m positive I’m safe, however, I still wear the moneybelt as it’s the best guarantee I won’t just plain lose track of my valuables, which is easy to do when traveling. Yeah, I know, the moneybelt makes you look fat, and there’s not much to be done about it, unless you’re traveling in winter and you can cover it in a lot of layers. I’ve sewn some old moneybelts inside of tank tops, to make a sort of moneybelt shirt. I find them more comfortable than the around-the-waist variety, but they are certainly unflattering. Beer gut or monoboob: what’s it going to be? Ultimately, though, I’ll take unflattering over the panic that would result from my losing my passport, cash and credit cards.